Two islands lie offshore Kaupo Beach Park. Manana, the larger island, is popularly known as Rabbit Island. In the late l880s John Cummins, the first owner of Waimanalo Plantation, released rabbits on the island and a colony of them survived for many years. The last of the rabbits were removed in the early 1970s. 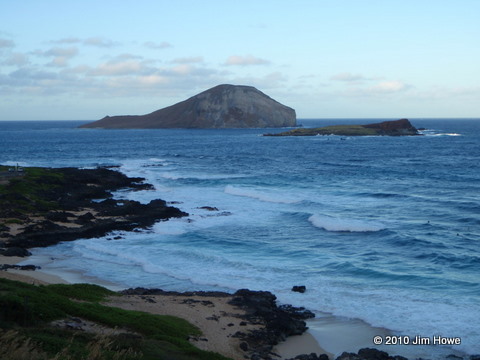 Rabbit Island's Hawaiian name, Manana, means to stretch out or to protrude. Kaohikaʻipu, or Black Rock, is the smaller island adjacent to Manana. Manana and Kaohikaʻipu Islands are part of the HawaiʻI State Seabird Sanctuary, where landings are prohibited without a permit. Manana is a volcanic crater, its floor honeycombed with the nesting burrows of wedge-tailed shearwaters. Many other sea birds nest on both islands. A surf site called Rabbit Island breaks on a shallow reef at the north end of Manana.